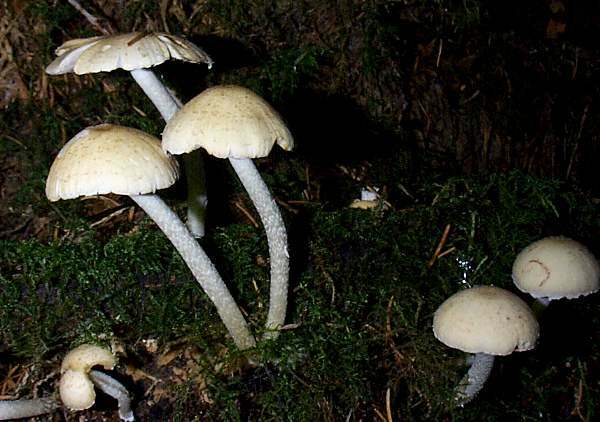 In the past more commonly referred to as the Common Crumblecap, Psathyrella candolleana is a very delicate member of the inkcap-related group of fungi. 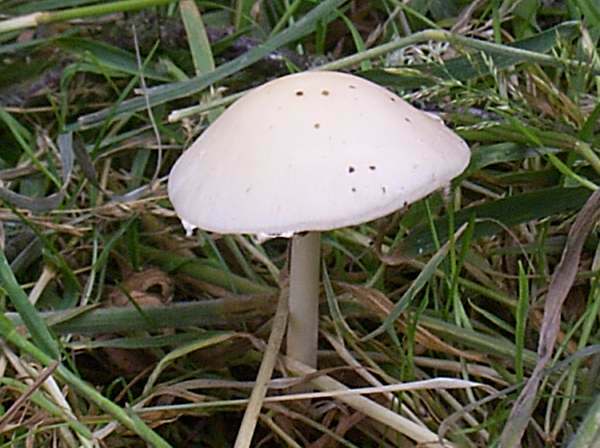 This mushroom occurs in all kinds of woodlands and woodland clearings as well as on timber buried in damp grassland. The specific epithet is nothing to do with candles; it is in honour of the Swiss botanist Augustin Pyramus de Candolle (1778-1841). His botanical author abbreviation is DC. Common and widespread in meadows, on lawns and in woodlands throughout Britain and Ireland, the Pale Brittlestem is also found throughout the European mainland and in many other countries including North America. Over the past 230 years Psathyrella candolleana has acquired numerous synonyms including Agaricus appendiculatus Bull., Agaricus candolleanus Fr., Psathyrella corrugis var. vinosa (Corda) Cooke, Drosophila candolleana (Fr.) Quél., Hypholoma felinum (Pass.) 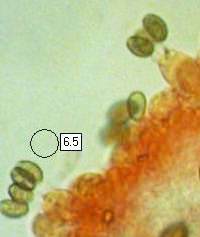 Sacc., Psathyrella appendiculata (Bull.) 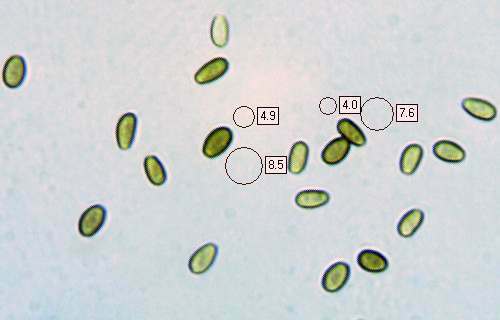 Maire, Psathyrella egenula (Berk. & Broome) M.M. Moser, Hypholoma incertum Peck, and Psathyrella microlepidota P.D. Orton. Psathyrella, the genus name, is the diminutive form of Psathyra, which comes from the Greek word psathuros meaning friable; it is a reference to the crumbly nature of the caps, gills and stems of mushrooms in this genus. The specific epithet candolleana honours Swiss botanist Augustin Pyramus de Candolle. 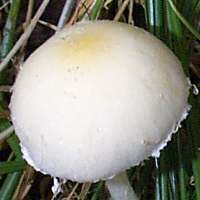 The cap is thin-fleshed and very crumbly; typically 3 to 6cm in diameter and usually broadly umbonate when fully expanded. Cap colour varies considerably, but is usually brownish when young and fresh becoming much paler at maturity. 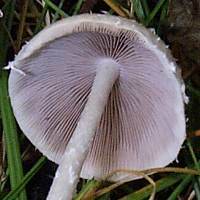 The gills are adnexed, crowded and initially white, becoming pinky-grey and eventually very dark brown as the spores mature. 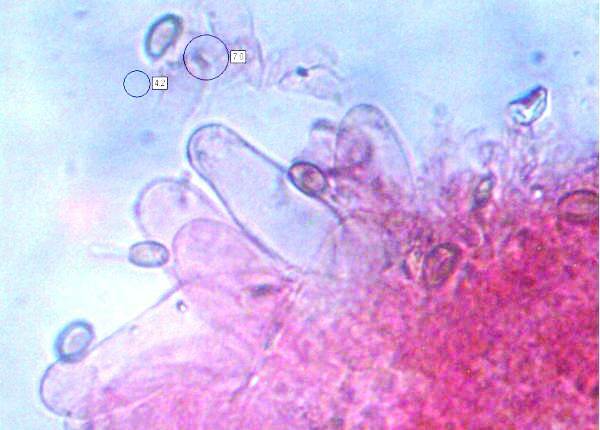 These fungi do not deliquesce (dissolve) at maturity. 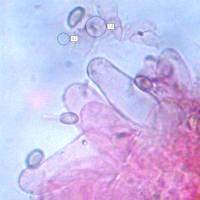 Up to 6cm tall, with a diameter of 3 to 5 mm; white and very brittle. 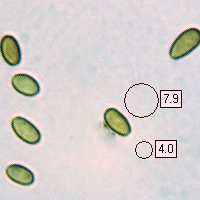 Thin-walled; shape rather variable, but mostly sub-utriform or clavate, up to 50μm tall and typically 12μm across at widest point. Ellipsoidal, smooth, 6.5-9.5 x 4-5μm; with a germ pore. Saprobic, appearing in small groups or occasionally singly on soil in woodland or in well-shaded grassland. June to November in Britain and Ireland. 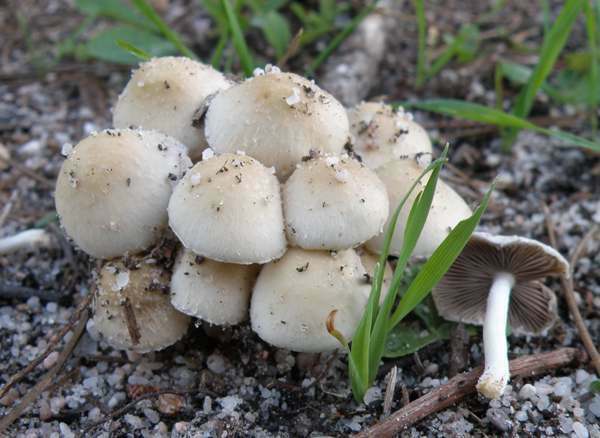 Psathyrella piluliformis has a darker cap, is smaller and usually grows in much larger groups; it is almost invariably on or beside broadleaf tree stumps. 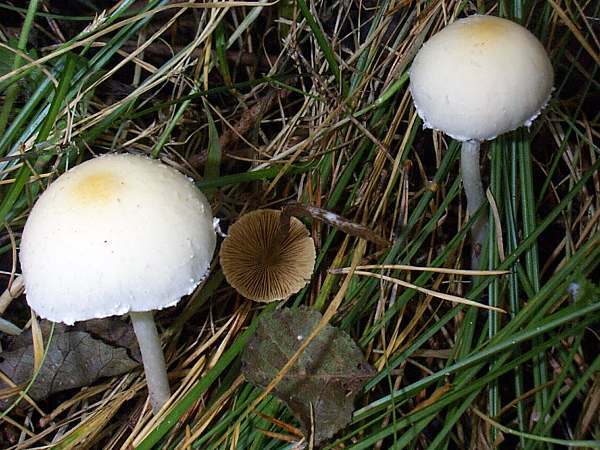 In many (but not all) field guides Psathyrella candolleana is recorded as 'edible but not worthwhile', while other field guides record it as inedible or edibility unknown. These mushrooms are insubstantial and it would take a lot of them to make a meal, so unless you are desperate and nothing else is available the Pale Brittlestem is probably not worth considering as a culinary collectible. Bertrand, G. (1913). Quelques notes sur les Psathyra et les Psathyrella récoltés en Lorraine. Bulletin Trimestriel de la Société Mycologique de France 29: 185-188, tab. 8.